A four-week archaeological evaluation was undertaken on behalf of Pembrokeshire County Council, during July-August 2003, in the entrance area of Narberth Castle, within the area of the medieval castle Outer Ward. At least 3 east-west aligned, extended human burials were revealed, two of them superimposed, with the potential for at least one more in the form of a soilmark with similar dimensions and alignment. They were all simple dug graves. They lay on average a mere 0.20 metres beneath the present ground surface. This area lies immediately west of an earlier evaluation, undertaken during 2001-2, when at least 20 similar burials were revealed. It is likely that the burials are part of a much larger cemetery. Inter-cutting graves suggest that the cemetery was in use for a considerable period of time. Pottery and a single radiocarbon date demonstrate a late 12th century – 13th century date for the burials. Pottery from the 2003 grave fills suggests that they are of similar 13th century date. It is tentatively suggested that the cemetery indicates the former location of a church prior to its establishment on its current site 180m to the west, perhaps in the mid 13th century when the castle Inner Ward was rebuilt in stone and the Outer Ward was presumably formally established. In addition, building recording has been undertaken on the standing fabric of the castle preliminary to the ongoing programme of consolidation being undertaken by Pembrokeshire County Council. This has so far concentrated on the SW Tower where a number of new features, including two window embrasures, evidence for a ‘garderobe’ or latrine, corbelled-out between the tower and the south curtain wall, and the wall-walk, have been revealed by vegetation clearance. The character of other built features appear to confirm that the large triangular earthwork south of the castle is a Civil War ravelin, and that the Great Hall (and vaulted solar?) is of a contemporary build with the castle defences. Ludlow N, 2003 ‘The Castle and Lordship of Narberth’, Pembs. Historian Vol. 12, 5-43. Ludlow N and Jameson T 2003 Narberth Castle 2003: Interim Report, Dyfed Archaeological Trust Report. 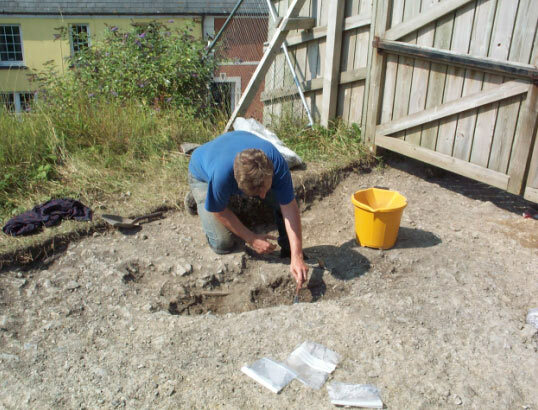 Murphy K and Crane P 2002 Burials at Narberth Castle, Dyfed Archaeological Trust Report No. 2002/50. Murphy K and Crane P 2002‘Burials at Narberth Castle’, Archaeology in Wales 42, 73-76.